Find the perfect spawn for you. Minecraft 1.12 has introduced loads of new features, and many players will be dying to jump in and get a headstart. This handy guide will give you 15 quick and easy-to-find and best Minecraft 1.12 seeds that’ll spawn you in a great place, every time. Whether you’re looking for a spawn in a desert temple or a water temple, these Minecraft 1.12 seeds have something for everyone. There won’t be a lot of walking to do, so buckle up for a nice and quick start. This seed is perfect for those looking for a nice little getaway. The seed will spawn you just on the outskirts of a roofed forest, looking straight at a massive mansion – with easy access to all the mushrooms you’ll ever need. If you’re looking for a nice headstart to get you past the sometimes tedious early parts of the game, this seed will spawn you in a village with a well-equipped blacksmiths. You may be able to trade with the villagers, too. Type this Minecraft 1.12 seed into your world options, and you’ll end up spawning right at the entrance to a vast mesa biome, with a desert temple to give you a great start to your journey. Entering this seed puts you in the middle of an Ice Spike biome, letting you go on a wintry adventure full of danger and wonder. 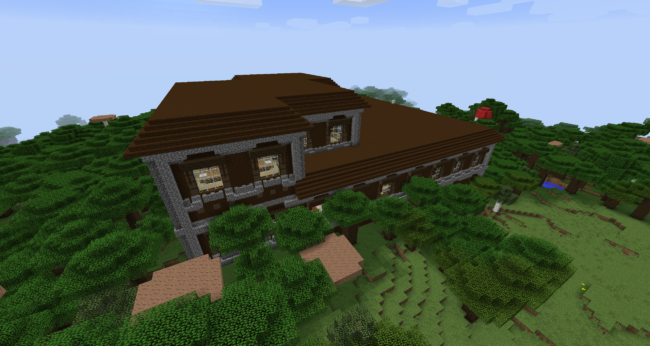 You’ll want to find food and builld a house quickly here, because the nights can be unforgiving. This seed spawns you just a stone’s throw away from a peaceful village with a good access to food. Nearby are the entrances to a cave network, too, which’ll get you all the materials you’ll need for a while. This seed will spawn you high in the mountains in a savanna biome. Right in front of you is a surface lava spawn, but you’ll get the real treat when you turn around; a huge and beautiful natural structure. If you’re looking for a classic Minecraft experience with a modern twist, use this seed. It’ll spawn you on a small island in the middle of a vast ocean, similar to the classic survival island maps, but this one has a desert temple lurking in the waters below. If you’re in the mood to be creative with your house placement, this’ll be perfect. This seed spawns you a few meters away from a really cool-looking rock formation just off the coast. There’s a lava spawn, and plenty of entries for you to go spelunking. This seed spawns you on the edge of a desert biome, with a desert temple just slightly off to the right. That’s not all, though; if you turn around, you’ll find a big savanna village with seven farms, giving you a good food start, and a great baseline to survive your first few nights. This seed will place you right on the edge of a small forest biome, but if you turn around you’ll find a beautiful beach formation, followed by a massive desert, with a surface pool of lava. It’s rare to find a formation like this, so take advantage of it! This seed spawns you on a beach, really close to a coastal village that’s half-spawned in the water. Expect to do some swimming, but pick up some nice early loot in the process. It’s also right next to a ravine, meaning you can jump in and find loads of great materials. Here, you’ll find yourself in a tranquil forest with access to everything you’ll want to start your game off. Head a little south, and you’ll see a snow-capped hill with a flat top, giving you a great place to build a mountain retreat. For those of you after a getaway in a relaxing hills biome full of wintry trees, this seed works for you. There is a ton of wood here for you to build a beautiful wooden cabin without much danger, and if you look around near spawn you’ll find quick access to iron. And those are our top 15 best Minecraft 1.12 seeds that we’ve come across so far. If you’re look for more, don’t worry. We’ll be expanding this as we uncover more. This seed is perfect for those looking for a nice little getaway. The seed will spawn you just on the outskirts of a roofed forest, looking straight at a massive mansion - with easy access to all the mushrooms you'll ever need.